It is no mystery that the kitchen is the busiest room in the house. Have you noticed when you have a party or just some friends over, everyone ends up congregating in the kitchen. The delicious smells, the hope of something inviting, and that is usually where the hosts are preparing food and drinks, all make the kitchen the space where people want to be. This is true for most family lifestyles as well. Kids to their homework at the kitchen table and this is where we hear the stories of the day. Having a kitchen space that is welcoming and comfortable is one of the deciding factors in choosing a new home. This blog we are discussing the various aspects of kitchen design to create that special feel we all want in our home. A good layout is critical to not only to form but function. “The Golden Triangle” is an interior design concept that focusses on the connection between the three most used appliances in the kitchen – refrigerator, sink, and stove. It doesn’t matter how nice it looks, if you have an obstacles between these three areas, you will likely be frustrated in your own kitchen. Remember, the kitchen is a work space, also for socializing and congregating, but work happens there and ease of use is critical to the entire experience of the kitchen. Kitchen islands can be an excellent use of floor space and look very sharp. It allows for additional work space, extra storage, and a place to socialize. It is critical that the placement of the island in no way impedes the flow of movement between the sink, refrigerator, and stove. One way to deal with this is to add a sink or stove to the island, incorporating it into the “golden triangle”. There are specific dimensions recommended for the amount of space needed in the room, placement, and size of the island, which we will help you in the design phase. The other areas of attention include countertop appliance placement, the trash area, area to sit aside from the table (space permitting), food service area, and storage. All of these are important considerations when designing the perfect kitchen for your family. Most of us are impressed by the look of top quality materials, as we should be, they are lovely. But don’t make the mistake of sacrificing how well your kitchen functions for an impressive look. You can have both if you pay attention to these details. 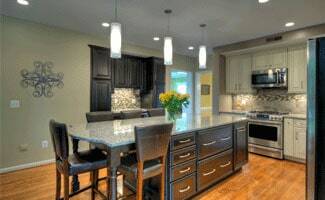 At Rendon Remodeling and Design, we are experts at helping you create the perfect kitchen for your family.